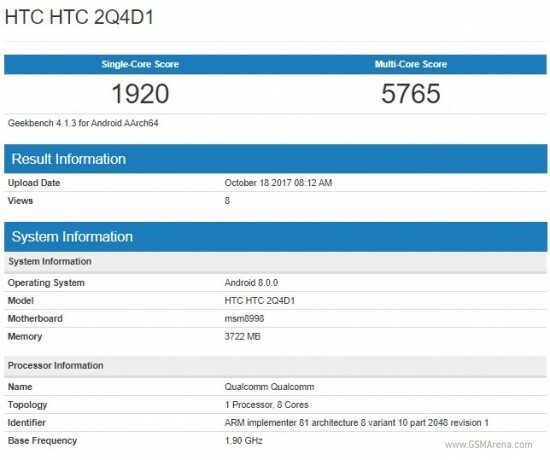 A mysterious HTC device has just popped up on Geekbench's website with a Snapdragon 835 chipset, 4GB of RAM and running Android 8.0.0 Oreo. Our best guess is that this is the HTC U11 Plus, which entered the rumor mill a few days ago when a press invite for an HTC event on November 2 was leaked. The score recorded by the unnamed HTC smartphone falls within expectations for a Snapdragon 835 device and is around the same as that of the U11. What stands out the most is the 4GB of RAM - the HTC U11 comes with 4GB as standard with a 6GB model being sold in certain markets like the US. Perhaps the Plus will similarly have two different versions when it comes to RAM.